Great gem-y beach. Time-consuming hike that is over 3 miles one way. Limited picking time predicated on tide. Everyone says to go to McCurdy Point and they all begin picking right there. The prevailing current sweeps the glass further down the beach! This is critical. Ignore the point and walk at least! a half mile beyond. Go to the very end of the visible stretch if you can. We watched locals stride right by the point and go all the way to the end - then work their way back to the point, picking the entire way. We went out at dawn when there was barely enough light to see, and there was still a couple that had already got there! They must've used headlamps to navigate the path in front of them. Hubs found his first tiny orange, I found 2 reds (small) and there was a ton of finely tumbled white. 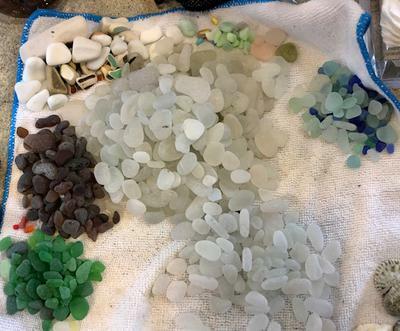 Aqua, brown and green were scarce and not as "gem-y." Rare colors are there, and if you're a collector of fine white, that too. Very busy on weekends. Extremely limited shells, interesting agates.